Allotment gardening has been an important part of society for hundreds of years. Today, they are extremely popular and waiting lists are long. In addition to the obvious benefits of growing fresh healthy food for free, allotment gardening has been demonstrated to have both physical and mental health benefits. 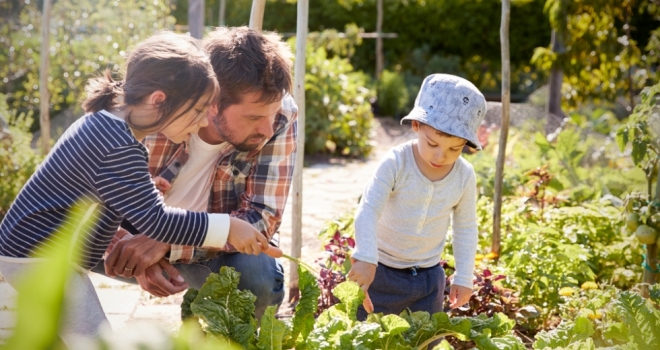 Louise Ridings of Stacks Property Search says, “Historically there was a feeling that allotments were for the retired, but increasingly we’re finding that young families are getting involved. There’s a huge interest in bee keeping too. At The Wintles, a development by Village Makers in Shropshire, allotments were created within the 12 acres of communal space. Residents embraced the concept of allotment gardening, and took it to a whole new level. Now, in addition to the 40 original allotments, there are established vines, the orchards are cared for and fruit harvested, and residents keep pigs, bees and chickens. At Village Makers’ new development, Oakley Orchards in rural Essex, there will be an allotment allocated for every new resident that wants one. The landowner and local farmer, Pete Thompson, is a keen conservationist who strives to protect the integrity of the local environment. He says, “Oakley Orchards is adjacent, as the name suggests, to orchards, but we’ve also incorporated four new orchards into the development itself, together with other areas of communal green space including a herb garden and areas of unmown grass to nurture insects and wildlife. We are using innovative methods to manage the farm’s orchards and are providing excellent breeding sites for a wide variety of wildlife. Bob continues: “An adventure playground and new village hall are also planned as part of the neighbourhood. In addition to the primary purpose of growing your own food, allotments provide local wildlife with sustainable habitats and corridors. Plot holders can take further steps to support wildlife and maintain a balanced eco-system by reducing the use of chemicals, companion planting, and planting nectar rich flowers to attract pollinators and beneficial insects. This in turn will reduce pests and diseases.